Premier Gymnastics of the Rockies traveled to Fort Worth, Texas on January 25-27 to participate in the “2013 Metroplex Challenge”. The event host was Metroplex Gymnastics of Fort Worth. 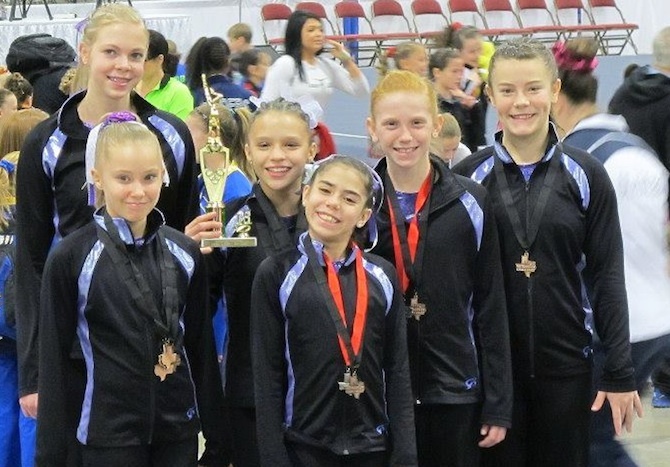 The Premier Gymnastics level 8 team placed third in the team competition. Bailie Holst, Level 10 gymnast, placed second All-Around in a very competitive Senior Session with a score of 36.875. Holst placed third on Vault, Bars and Beam. In Level 7, Moira Dillow placed fifth on vault in the Junior B Division. In Level 8, Jaxin Melby was Vault Champion with a Score of 9.300 and Kairey Vela placed second on Bars with a Score of 9.500 in the Junior A Division. In the Junior B Division, Aryn Archambeau placed fifth on both Vault and Floor. Premier will be heading to Chicago this coming weekend, February 8-10. “Chicago Style” is the largest gymnastic meet in the country with over 4,000 competitors. Illinois Gymnastics Institute will be the host and the venue will be at the Navy Pier.